Donald Trump has chosen Elaine Chao to serve as transportation secretary in his administration, according to Politico. 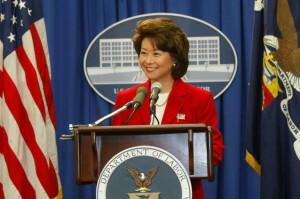 Chao was secretary of labor under George W. Bush and is married to Senate Majority Leader Mitch McConnell. An official announcement is expected shortly. Chao has a long resume in federal government under Republican presidents. She served as deputy secretary of transportation under George H. W. Bush, rising through the agency from a post in maritime administration. Chao’s family owns an international shipping empire, and her father is singlehandedly responsible for making McConnell one of the richest men in the Senate, according to the Nation. While Chao has more experience in government and a less extreme ideological background than other Cabinet picks, she has been on the Trump team for a while, serving on the campaign’s Asian Pacific American Advisory Council, according to Politico. Chao is no environmentalist, having resigned from the board of Bloomberg Philanthropies as a result of its “Beyond Coal” campaign. Her involvement with the foundation reportedly became an issue in McConnell’s reelection campaign in Kentucky. She’ll now be operating for a White House that denies the science of climate change. Federal efforts to coordinate transportation and land use policies to reduce greenhouse gas emissions may not survive in the Trump DOT, but that would have been the case no matter who landed the transportation secretary job. Under Chao, Trump’s DOT could threaten recent progress on initiatives like modernizing federal street design guidelines. An unscrupulous DOT chief could also allow the federal approval process to become an instrument of self-dealing for Trump and his cronies. One thing to keep in mind, however, is that U.S. DOT wields limited influence. The hallmarks of the agency under Obama — like the $500 million or so spent annually via the TIGER grant program — are small compared to the tens of billions of dollars in federal transportation funding distributed by formula to state DOTs each year. The primary threat to policies that improve transit, biking, and walking will come from the GOP House and Senate. With a Republican in the White House, Congress will have a freer hand to pursue policies like the elimination of federal transit funding, which would have devastating consequences for cities. Advocates will need to keep a close eye on U.S. DOT, but the really big fights ahead will happen in Congress. So the Interstate Highways in Hawaii are screwed, right? Chao gave a tight-lipped performance that didn't reveal much about how she would use the regulatory and approval power at her disposal, but here are three instances where you can try to read the tea leaves. So far, the new batch of TIGER grant winners look like solid choices to improve conditions for walking and biking. A panel of experts told Congress that, even with perfectly executed public-private partnerships, the federal government still needs to provide its own support -- especially for projects, like transit lines, that aren't guaranteed to generate toll revenue for profit-seeking investors.